We are professinal supplier of tombstone and able to produce and supplier over hundreds containers of tombstone in different styles to Europe countries per month. Europe is a big continent with over 7 hundreds million of people lived there and there are 45 countries totally. Therefore, the requirement on tombstone is different based on different location, history and culture background etc. Most of Europe monuments are made in granite such as dark granite,red granite,muticolor series granite,himalaya blue,grey granite,white marble,olive or tropical green granite,yellow sandstone,white marble,tan brown granite etc. The main design of monuments in Europe are headstone with kerbsets together. The design of headstone will be based on the favor of local person traditionally as monuments belongs to special commodities. 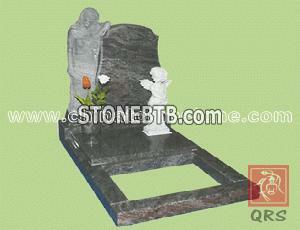 The popular headstone styles are celtic cross,ogee,apex,cross,heart,bible,wave,round, canopy,wing with cross etc. The size of headstone will be different based on the requirement of different countries or area such as 90x70cm,90x80cm,80x60cm,95x65cm,95x75cm,120x80cm,100x80cm etc. The thickness of headstone we made can be 5cm,6cm,7cm,8cm,9cm,10cm,12cm,15cm,20cm or other customized specification to satisfy your special demand. The dimension and design of kerbsets parts of monuments will be decided by lots of factors such as the regulation from cemetery yard,favor or purpose of tombstone etc. Some of them has covers one,two or three pieces and some of them has no cover, with flower bed only to plant some flower or small shrub inside of surrounds. The over size of kerbsets can be 200x100cm,230x210cm,220x120cm,250x120cm,244x91cm (96”x36”) etc.